Guided by the Mercy mission, Emory Saint Joseph’s Hospital has continued on a path of service and growth since its founding in 1880. Today, that same spirit of compassionate care endures as Sister Denis Marie Murphy and Sister Peggy Fannon model, with their respective talents, this service towards patients and families. The youngest of five children, Sister Denis Marie was born Joan Murphy in Savannah, GA. She attended Saint Vincent’s High School, and then worked at the Savannah Sugar Refinery Company for three years following graduation before entering the Sisters of Mercy in 1952. Sister Denis Marie chose her religious name in honor of her only brother who was killed during World War II. Prior to her work at Emory Saint Joseph’s, Sister Denis Marie earned her masters degree in religious studies and served in education for 24 years, including 14 years at Our Lady of the Assumption Catholic School in Atlanta. Her subsequent clinical pastoral education ministry includes work with the sick and homebound in a Birmingham, AL parish and at Mercy Hospital in Baltimore, MD. 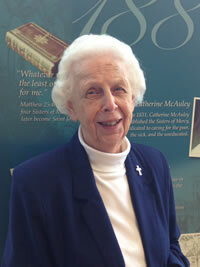 Sister Denis Marie began at Saint Joseph’s Hospital in 1991 as a chaplain. For more than 17 years in this role, she comforted many families in the cardiovascular intensive care unit (CVICU) and in orthopaedics. Today, she is using these same valuable skills, along with her familiarity with patients, their families and staff, to work as a patient advocate. Sister Denis Marie assists families in navigating the health care system and follows up on patient questions and concerns. The second oldest of eight children, Margaret Fannon grew up in Atlanta, attending elementary grades at Our Lady of the Assumption Catholic School and then St. Pius High School. Her father died when she was in her first year at Saint Joseph’s nursing school and her mother died four years later. Margaret raised her five younger brothers while working at Saint Joseph’s, and when the youngest turned 21, she moved to Baltimore to pursue her religious calling with the Sisters of Mercy. 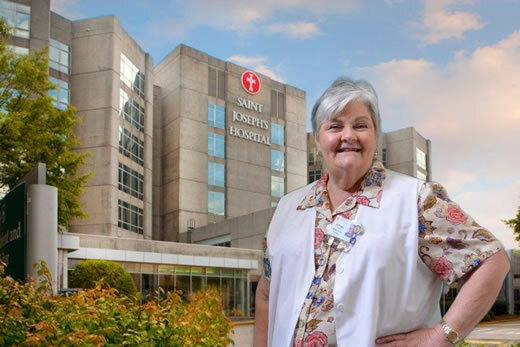 During Sister Peggy’s 42 years at the hospital she has worked as a charge nurse in the pediatric unit, with burn patients, and in the areas of oncology and neuro/vascular plastic surgery. Today Sister Peggy works as a patient educator with the vascular stroke unit and medical surgical unit. She is a certified diabetes educator and helps these patients understand their illnesses, the risk factors that set them up for problems and ways to manage them. Last year, Sister Peggy was named a Georgia Hospital Association G.R.E.A.T. Ambassador (Giving Recognition for Excellence, Advocacy, and Teamwork). The G.R.E.A.T. Ambassador program celebrates and showcases the commitment and caring that hospital employees bring to their job, to their community and to health care in Georgia. Sister Denis Marie and Sister Peggy are enduring examples of the Mercy Mission in action.